Usted habla español? Teach your kids these simple phrases to get them started learning a new language. Spanish is fairly easy to learn, fun to speak, and adds to the skill set of your young global citizen. 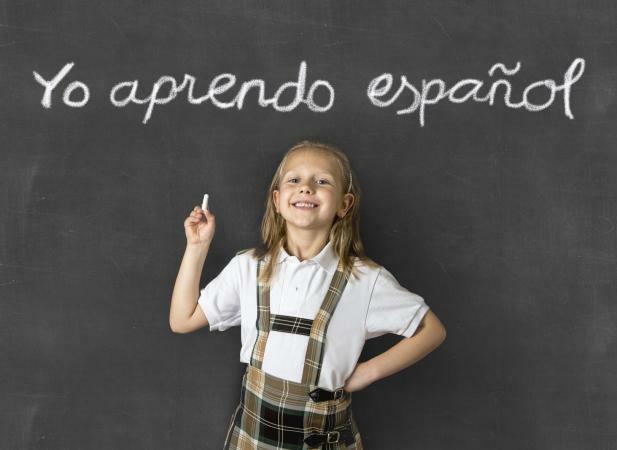 Everyday Spanish for kids is useful in a nation where more than 37 million people claim Spanish as a first language. Spanish is the second most-spoken language in the U.S. and Hispanics are the fastest-growing U.S. demographic. Teach your kids some basic phrases to introduce them to their Latin heritage -- or their American future. Por favor…de nada. (POR fah/VOR…day NAH/da) Please…thank you. Ven aca…siéntate. (BEHN ah/CA…see/EN/tah/TAY) Come here…sit down. ¿Dónde estás? (DOHN/day ess/TAHSS) Where are you? Dime otra vez. (DEE/may OH/trah VAYZ) Tell me again. ¿Tienes hambre? (tee/EN/ez AHM/bray) Are you hungry? Es hora de comer. (ess/OR/ah day koh/MARE) It's time to eat. ¿Quieres más? (kee/AIR/ess MAHS) Do you want more? Lo siento…con permiso. (dess/KOOL/pah…kohn pear/MEE/soh) Sorry…excuse me. Me gusta…me encanta. (may GOO/stah…may eng/KAHN/tah) I like it…I love it. Me toca…te toca. (may TOE/kah…tay TOE/kah) It's my turn…it's your turn. Ten cuidado. (DEN kwee/DAH/doh) Be careful. Cierra la puerta. (see/AIR/ah lah poo/ER/tah) Close the door. Dame un abrazo. (DAH/may oon ah/BRA/ssoh) Give me a hug. Te amo. (tay AH/moh) I love you. OR: Te quiero. (tay KEE/air/OH) I love you. Que sueñes con los angelitos. (kay SWAY/nyez kohn lohss ong/hay/LEE/tohss) Sweet dreams. Sesame Street for Spanish-speaking audiences is called Plaza Sesamo, and Big Bird and friends -- always the eager Elmo -- chat away entirely in Spanish. That's a great way to learn a language. A child who is encouraged might pick up a rudimentary fluency if he watches enough multilingual Muppet antics. The original show, in English, does incorporate some Spanish to teach kids that every language has meaning and knowing more than one is cool. For three seasons, Elmo, along with Grover, Rosita, Gabi and Maria, introduced a popular Spanish-language segment called "Word of the Day." Sesame Street has created some printable flash cards of Elmo's favorite Spanish words for you to download. You can find Sesame Street videos online that welcome you to bilingual fiestas with me encanta tenerte aquí (may eng/KAHN/tah tay/NARE/tay ah KEE)-- a phrase that means: "I love having you here." Subida!…Arriba! (Spanish: SOO/bee/dah; Latin American: soo/BEE/dah...ah/REE/bah) Climb!…Up! Vamanos!… Espera! (VAH/mah/nohss...ess/PAY/rah) Let's go!…Wait! Tengo una idea! (TENG/oh OOH/nah ee/DAY/ah) I have an idea! Muzzy, El Grande is a well-known children's language program developed by the BBC to reach kids on their level with a wickedly fantastical fairytale about a benevolent monster who eats clocks and helps save the day in the Kingdom of Gondolandia. It works on a grown-up level, too! Find a sample online or borrow it from your library for equal parts laughs and language learning. Casual: Hola! Soy [su nombre]; (OH/lah! Soi…); Hi! I'm [your name]. Tengo un mapa. (DENG/oh oon MAH/pah) I have a map. Me gusta las hamburguesas. * (may GOO/stah lahss AHM/boor/GAY/sahss) I like hamburgers. *If you are Muzzy, substitute los relojes (LOHSS ray/LOH/hayss) for las hamburguesas because Muzzy the monster is a real time-eater and he prefers to munch on clocks. Nailing a few Spanish phrases is only the beginning of a true journey into the language. Make it fun and the words will stick as proficiency and interest grow. Singing songs, repeating rhymes, playing games, reading books and watching age-specific shows are all good ways to introduce the sounds and syntax of Spanish to a little linguist. By 2060, predictions are that nearly 129 million Americans will speak Spanish, making this the largest Spanish-speaking country in the world. Get a jump on the future with un poco de español today.